Back again after another long hiatus from blogging. But I have been making cards so I have a few to upload. Today I want to show a card I made for the 100th Just Rite Friday Challenge. Congratulations to Just Rite on reaching this milestone. The theme of this challenge is doilies so I decided to use a HFC die (Decorative Blossom Corner) to create my partial doily. I also used a Memory Box die for the floral spray. Both were die cut from whisper white c/s. The background patterned paper was a remnant from my stash so the company of origin is unknown. I adhered it to the front of a white 5x6 1/2" card base. Then I stamped two different medallions from the Samantha Walker designed Just Rite stamp set, 'For All You Do', on peach parfait c/s using versamark ink and heat embossed them with white EP. I cut then out with a die set from Stampin' Up! but I must admit the shape is slightly different so I had to trim them by hand. I guess I will have to purchase the JRS die set that fits their stamps as I own several sets and do not look forward to hand trimming every time I use them. 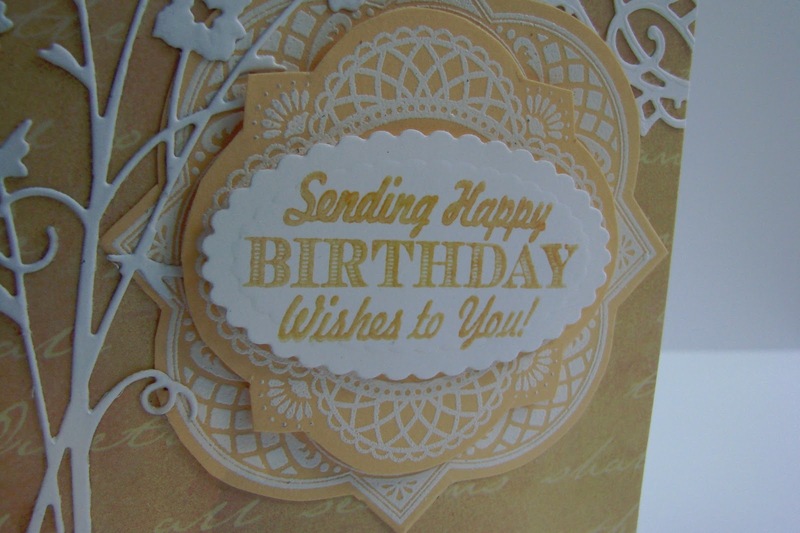 The sentiment is from the JRS set, 'Birthday Vintage Labels Four', and was stamped with peach parfait craft ink on white c/s and embossed with clear EP. 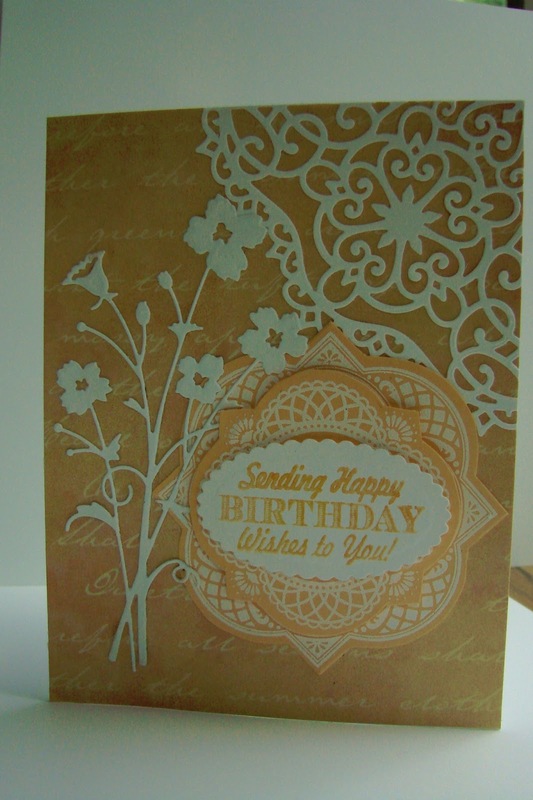 Then it was die cut with a SB petite scalloped oval die. I used some foam squares and some dries clear in addition to my AGT gun for adhesives. I will be back again soon with more of my recent creations. Ohhh, sooo PRETTY!!! I LOVE this set & die and it tops my Wishlist!!! Seems from the posts I've seen so far, yellow is on a roll -- know I've been using it a LOT lately.